Cryptobiotic soil is kind of like nature's first compost. It's an extreme compost, concocted in an extreme habitat. These Biological Soil Crusts form in harsh sterile areas where there is absolutely no organic material. For regular plants these environments are difficult to impossible habitats to live in. The biological soil crusts are most commonly found in arid and semi arid areas such as the American Southwest. Here the crusts can cover up to 80% of the land. 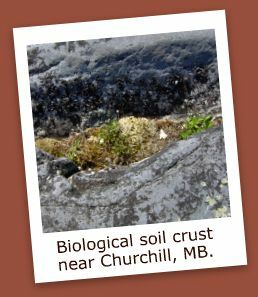 I've also found them in the high alpine areas of the Rockies and the Hoodoo area of Milk River, here in Alberta, and in the arctic area near Churchill, Manitoba. Cryptobiotic soil uses cyanobacteria to conjure their initial flush of life. These bacteria, also known as blue-green algae, are the main component of the biological soil crust. These remarkable bacteria are a big part of what makes life possible on our planet. Like plants, cyanobacteria or blue-green algae are photosynthetic. In short this means they can transform sunlight into energy in the form of sugars. Unlike plants they can fix nitrogen. Plants can not use gaseous Nitrogen. For it to be accessible to them the nitrogen has to be fixed into ammonia or nitrates. All life needs nitrogen, a key element in protein and only nitrogen fixing bacteria can use nitrogen directly from the air. Evidence suggests that cyanobacteria were in large part responsible for shifting our atmosphere from a high carbon dioxide mix to one rich in oxygen. The biological soil crusts form in sterile environments becoming a community of living organisms and their byproducts. Slowly, the combination of cyanobacteria, lichens, green and brown algae, other bacteria, microfungi, and mosses, add nitrogen, stop erosion and store water so that other plants can join them in creating an oasis of sorts in the once lifeless land. 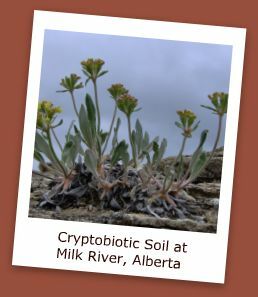 Cryptobiotic Soil benefits soil and plants in many ways. When moist, the cyanobacteria in the crust gets active. It moves through the soil leaving a sticky trail in its wake. As a result loose soil particles are brought together and the crust becomes very resistant to wind and water erosion. The crusts, when wet can swell up to ten times in size. In this way they store water, something especially helpful in the dry regions they are often found. The crusts contribute organic matter to soils which helps make nutrients available to the vascular plants when they come along and keep nutrients from being leached out of soils. Plants growing in soil crusts are higher in nitrogen, phosphorus, potassium, iron, calcium, magnesium and manganese. As well the cyanobacteria and cyanolichens in the cryptobiotic soils are able to fix nitrogen into a plant available form. If crusts are damaged by walking or driving on them it can take many years for them to recover. The cyanobacteria or blue-green algae recovers first - in five years or so. The other elements of the crust, the lichens and mosses especially, can take from 50 - 250 years to fully recover. I get excited when I see soil crusts. They are essentially conjured from the air by nature to make life possible for plants, and through plants, animals.